At the Mr. Pink incubator for cultural entrepreneurs we met up with a group of young people living in Murmansk. They were not all from the city, but some of them grew up in the towns of the region. They were students, entrepreneurs and professionals. They had a passion for Murmansk. Murmansk has changed a lot in recent years. Not only are urban spaces and roads being constructed and updated, new urban entrepreneurs—like the ones gathered in the building we were in—are also manifesting themselves in the the Leninskiy district where Mr. Pink is also located. 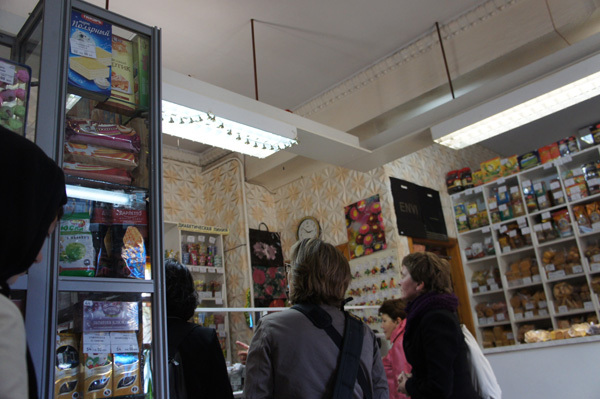 Childhood territory—the local candy store. 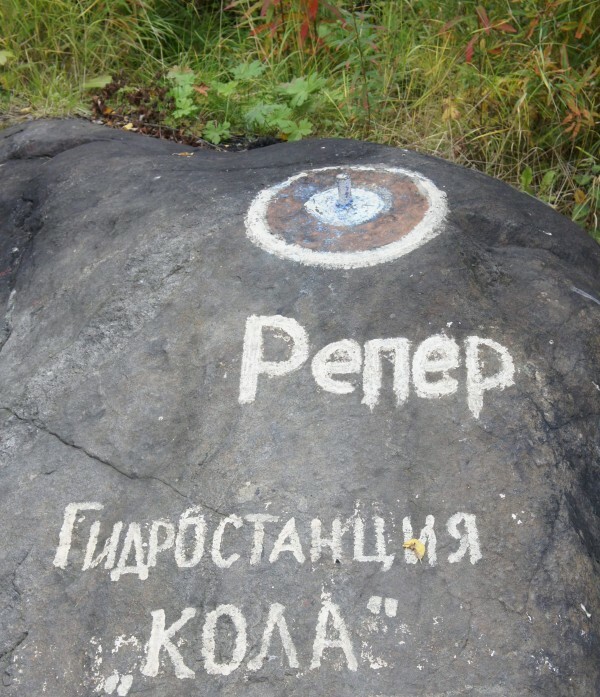 We walked through the Leninskiy district, roughly tracing a line towards the Northern edge of the city (‘POCTa’). 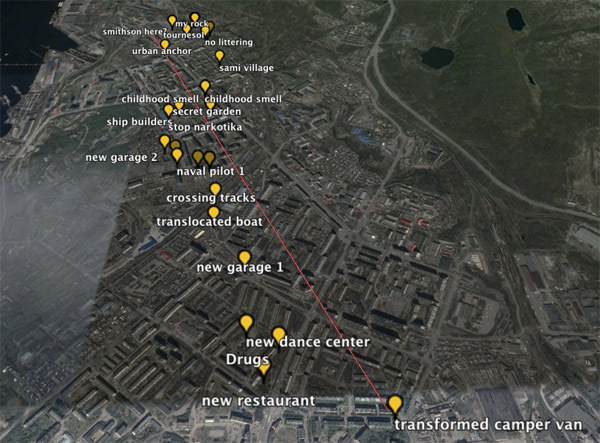 Following footpaths, crossing a school yard, climbing over district heating pipes and venturing into the backside of the city such as the garage districts that line many of the towns in Kola. We ended the trip at the smelly river that marked the northern perimeter of the city. The walk was inspired by architectural mapping methods, such as the Transect Walk. This is a participatory method for rapidly appraising material resources, land use practices and urban and rural contexts that is used by organizations like the World Bank and UN Habitat, particularly developed to be applied in developing contexts. Maps have agency and so does mapping. We inform our informants, new links are made and new stories are constructed while walking. According to James Corner, maps and landscapes are continuously and mutually co-constructed. Mappings and cities are also co-constructed—the mapped topography informs the planners, but the urban plans—which are also maps—inform the territory, marking the ground with constructions and surfaces. During the walk urban gardens appeared in the strangest places, full of flowers, hand painted railings and sculptured, reworked car tires. The ground floor of the city is generally publicly accessible. You can walk everywhere, and the gardens are not just for private consumption but display pride and a sense of ownership of urban space. They are fresh contributions to city along with the repaving of streets that the city is undertaking in preparation for its 100th year anniversary. The walk was mapped using MAPPA.